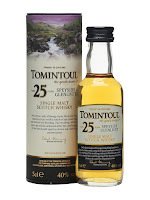 Normally the 25 year old is 43 %, but Tomintoul have been so kind to water this miniature version all the way down to 40 %. It is 25 year old, so it is distilled back when they were owned by Whyte & Mackay. The smell is sweet at first. Sweet fruits! Not much influence from the wood, considering that it is 25 year old. Some gentle fruit arrives first on the palate. Some dried fruits, but not very heavy. The slogan “The gentle dram” really shows here. It doesn’t change at all in the finish. It just continues for a while. Maybe the wood influence at first and the fruity sweetness dominating in the end. Why they would water it all the way down to 40 % is beyond my understanding… I can smell and taste that this has potential, but the flavors is just locked due to the low ABV. I know they are well known for their gentle drams, but this is just too gentle! It is a fine dram, but at the price, I would go for something else… I will give this 83/100 (21/21/21/20).